The basic principles and techniques of rug weaving have changed little since ancient times. The materials most commonly used to weave Oriental rugs are sheep's wool, cotton or silk. However, most Oriental rugs are woven with a wool pile and a cotton foundation. Wool quality depends on factors such as the animal's breed and diet, local climate and shearing season. After shearing, the wool is washed, carded (a combing process that straightens the wool's fibers) and then hand-spun or machine-spun into yarn. Lastly, the wool is dyed to various different hues and dried in the sun. Traditionally dye coloration was achieved using natural sources such as roots, bark, nut shells, berries or insects(known as vegetable dyes). Today, however, synthetic or chromium dyes are used predominantly due to their low cost and ease of use. The weaving is performed on either a horizontal or vertical loom. The vertical loom, primarily used to weave classical city carpets, is constructed of either wood or metal and consists of two horizontal beams supported by two rigid side pieces. The horizontal loom is the more primitive of the two loom types. It is typically used by nomadic people because its design allows for easy transportation. The horizontal loom lies flat and close to the ground. It is staked down on four corners with two wooden beams tied at either end. There are two fundamental styles of knots used to weave Oriental rugs: the Turkish knot (also called the Ghiordes or Symmetrical knot) and the Persian knot (also known as the Senneh or Asymmetrical knot). The decision to use one or the other of these knots is a matter of tradition; neither has any inherent advantage over the other. 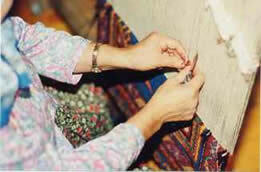 Generally, a detailed illustration of the carpet's design, called a cartoon, is drawn on paper before weaving. This cartoon, rendered in true scale and color, serves to guide the weaver through the rug-making process. Using the appropriate color yarn, the weaver ties knot after knot around the base of two adjacent warp strings and then cuts the yarn with a knife, thereby producing the pile. After each row of knots is completed, one or more weft threads are inserted and beaten down with a comb. The fringe is formed by the cutting of warps at both ends of the rug. For reinforcement, the sides, called selvedge, are bound or overcast with yarn. The roughly cut pile is given a final shearing to create a uniform pile height. Finally, the rug is washed to eliminate dust and dirt that may have accumulated during weaving. The rug-weaving process often takes months or even years to create the masterpiece that will transform and enhance your home.